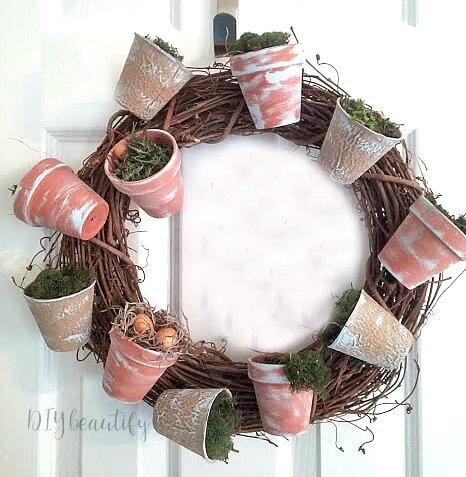 Dollar store supplies come together for this easy and Spring-like wreath! 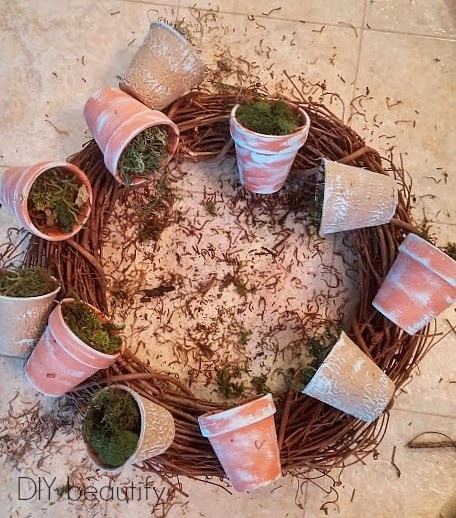 When I was in DollarTree recently, I spotted these mini terra cotta flower pots (3 in a pack) and decided it was time to finally make my flower pot wreath. I also grabbed a couple bags of moss. When I got home I realized I should have bought more pots because 6 wasn't going to be enough. But then I remembered I had a package of mini peat pots that I had purchased ages ago and had never done anything with. They were the perfect size and I actually liked that they contrasted with the terra cotta pots. I decided to slightly age and weather the flower pots by dry-brushing them with some paint. 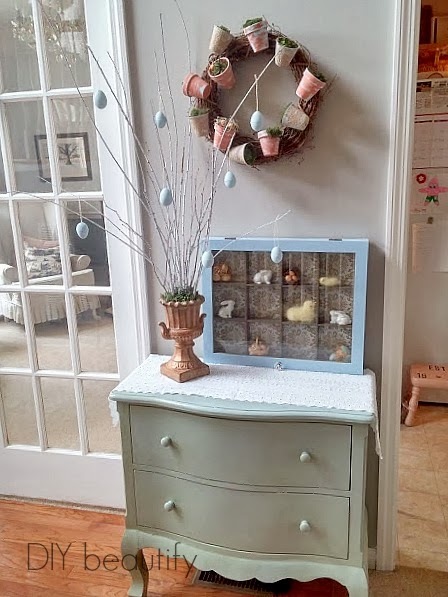 I used some left-over pale blue chalk paint that I had from when I made my chalk-painted Easter eggs. I didn't over-think this step, just very lightly brushed the paint on in random areas. Done. You could also use white chalk paint, or any very light color that you already have! 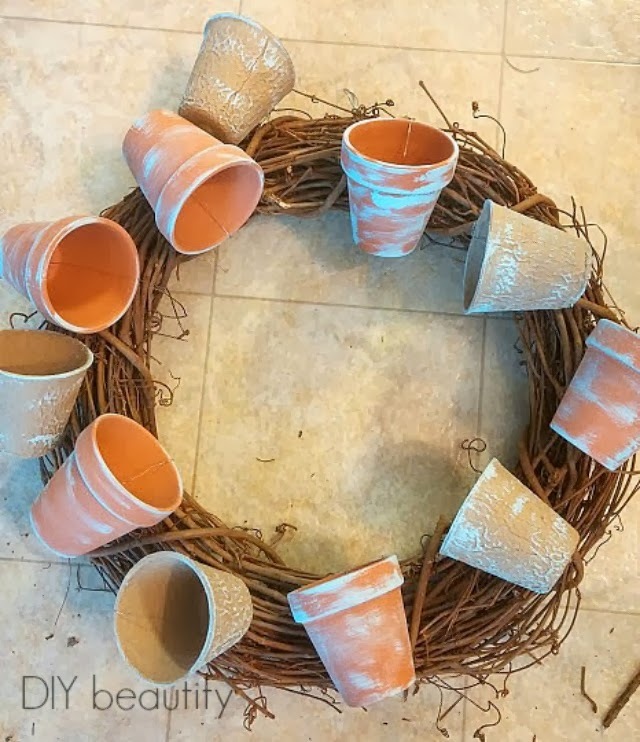 To attach the flower pots to my grapevine wreath, I used craft wire and simply threaded it through that handy dandy little hole in the bottom of each pot. And you thought it was there for drainage!! I wrapped the wire around the wreath where I wanted my flower pot to be and then twisted the wire tightly to secure (see last picture). Then I just tucked that little tail of wire under the pot to hide it. I continued in this way until all my flower pots were attached to my wreath. You can see how I tried to vary the angles to give it some interest. Now for the messy part, haha. You can see that I am doing this on my lovely vinyl kitchen floor. That's because of what you are seeing below. Moss is messy! But it's so pretty and green and really made this wreath come alive. I filled my pots with Spanish moss and then hot glued a little green moss just to the tops. 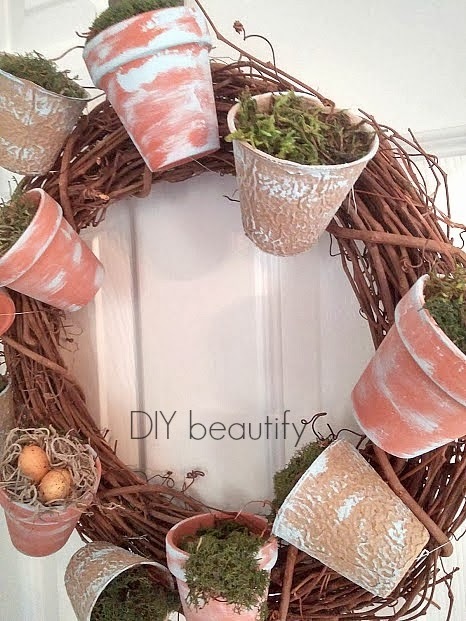 I love how earthy and 'alive' this flower pot wreath looks, even though nothing on it is actually living! All it needs is a little bird perched on top! Here is where I've hung it. This is my Easter vignette. It includes my Easter tree with chalk-painted Easter eggs and my shadow box filled with bunnies, eggs, chicks and nests. I'm trying to stay away from the 'cutesy' Easter stuff this year and stick with more natural, earth tones. I'm loving this little spot! 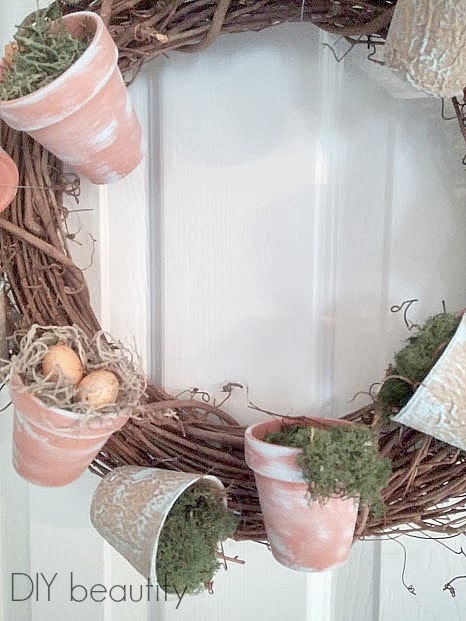 How will you be decorating your home for Spring and Easter this year? Have you started already?